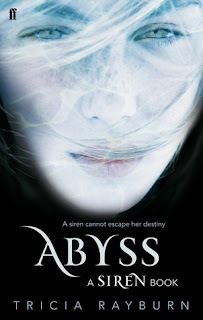 I seriously adore the Siren series, and I was absolutely thrilled and excited to read the third and final book in the series, Abyss by Tricia Rayburn. At times throughout reading this series I have become a bit confused, sometimes about sirens and sometimes by events that happened in previous books, but what really stands out for me when I'm reading these books are Vanessa as a character and also her relationship with Simon. Especially considering what happens in the second book of the series, I was really keen to read Abyss and get reacquainted with Vanessa and Simon. Slight spoilers ahead if you haven't yet read the first two books, Siren and Pulse. In Abyss, Vanessa makes the decision to return to the Maine lakehouse where her sister died and try to get things back to normal in her life, with her family and to get over her break-up with Simon. Vanessa seems pretty comfortable with being a siren and she's determined to do what she can, by going for swims and drinking saltwater, in order to get by instead of going down other routes that have meant people dying around her and also that which damaged her lovelife. But with the appearance of Vanessa's birth mother and the news that Vanessa is in fact a much more powerful creature than just a siren means that Vanessa is facing even greater consequences than before. Especially when, again, people start to go missing. In some ways, I felt like I could have done with less of the mystery aspects in Abyss, in which Vanessa and her friends are trying to determine why there are people going missing and dying in this small town. While that side of the story was fairly interesting, I felt like Abyss needed more closure from the series story arcs instead of closure in terms of this particular story being concluded. There's a lot going on in Vanessa's personal life - her feelings about her biological mother coming to stay and how that affects Vanessa's parents. I loved the heartbreak and tension that comes with any interaction in Abyss between Vanessa and Simon as they both clearly are not over each other. But all the reasons why they broke up are still there as are all the limitations and dangers of Vanessa actually being a siren. While I did love seeing them make up and even go on normal dates as a couple, I do still worry about their future. I think many fans of the series will not be happy with the conclusion of Abyss. To me, it felt realistic, I liked that there are no magical answers to get around Vanessa's needs. But I do definitely wish that it could have been explored a bit more fully. I loved getting to know Vanessa and Simon. I found sirens to be something that I enjoyed reading about and I thought this series was particularly interesting and gripping. I loved the mixture of murder, sirens and romance that came with these books, I was just hoping for a bit more towards the end. Really? You didn't want to know more about Vanessa and Simon? I loved them so much. Whaa, how has this series finished already? I still need to read book two! I hope I didn't spoil what happens in book two with this review, sorry!